Mix water and sugar. Bring to a boil and boil for about 15 minutes until it becomes a syrup. When thick enough, the index finger and thumb are dipped unto the mixture, when pulling them out and separating them the substance expands like a tiny rubber band. Separate the egg whites from the yolks. Save one egg white. Add this to the syrup to make it frothy. 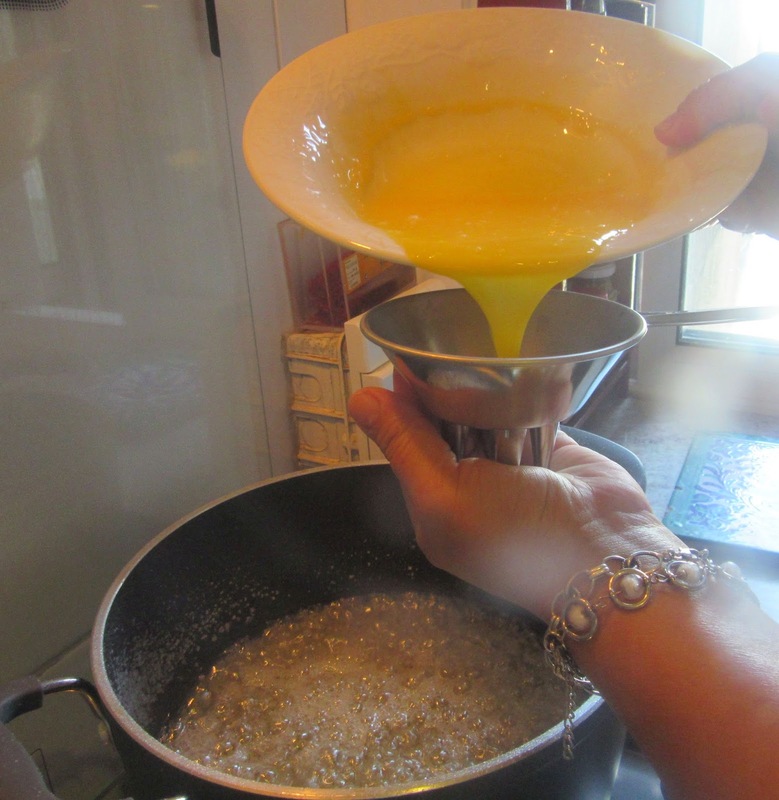 Pour egg yolks through a strainer until a double boiler. Heat egg yolks for a couple of minutes over moderate heat. 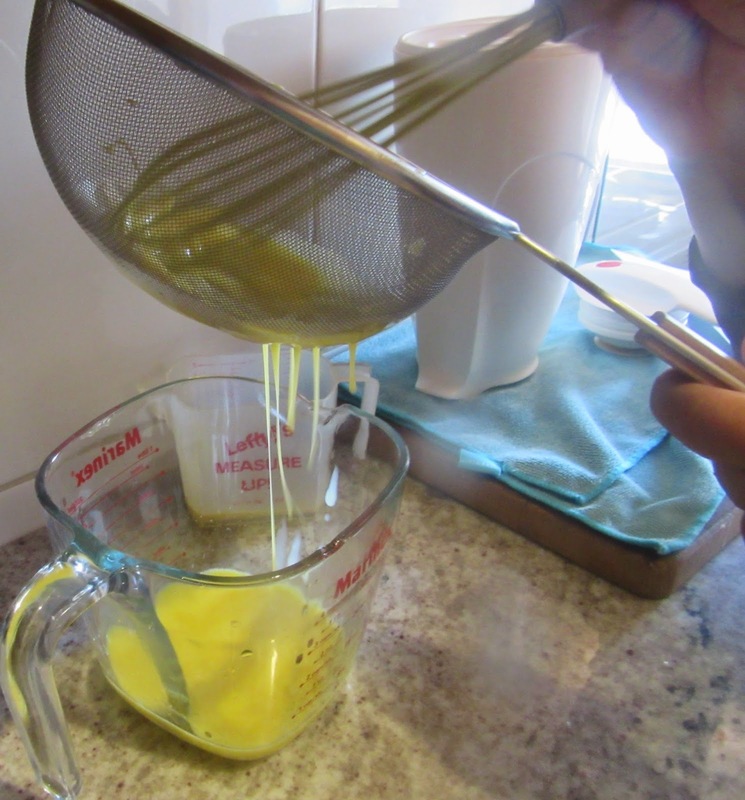 Pour egg yolks through a hilador, a colander with four small spigots or a syringe without a needle. Make circular motions non-stop with it over the boiling syrup. Let them sit 2 minutes. Remove the yolks with a spatula and quickly put them in ice water to stop them from cooking any further. Remove them from the water and drain them over a rack to dry. It is fascinating that older recipes explain very little and in the case of Granados, rosewater is used instead of tap water, which must be very tasty. 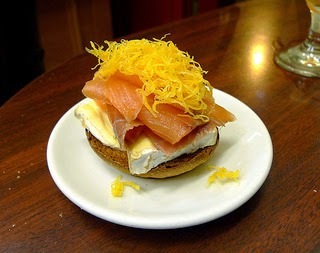 This looks like a very easy recipe but it is recommended to try it with one egg, separating the yolk and white, ½ c sugar and ½ c water for a starter as in the end it is very tricky but worth it. Serve with cold dishes, as decoration for a platter, filling for ham rolls, to top canapés, to decorate smoked salmon etc. Tomase açucar derretido en agua rosada, y póngase en vna cacuela, o plato de plat, y en aquel açucar echénse las hiemas de hueuos y háganse cozer con fuego arriba y abaxo, y siruase en el mesmo plato con canela, y agua rosada por encima. It is interesting to note that Granada garnishes his dish with cinnamon and rosewater. This is not done today.